Radiant (infrared) heating is the transfer of heat from a high-temperature object to a low-temperature object. The air in between the objects is not heated; radiant heat only heats the objects it comes in contact with. An example of this would be the sun warming the Earth. What is radiant in-floor heating? Hydronic, or radiant in-floor heating, is a method of heating a home, shop or other building with the heat concentrated in the floor. 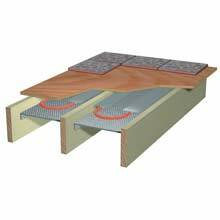 The system works by embedding special tubing in a concrete foundation or under wood or tile floors. Heated water then flows through the tubing, warming the thermal mass of flooring. Why choose radiant in-floor heating? There are many advantages of choosing radiant in-floor heating over other methods. This system produces even heat, which gently warms the entire room or building and results in uniform heating levels throughout the area, providing optimum comfort levels for the people inside the building. Also, because there is no energy lost through ducts or irregular air flow, this type of heating is more energy-efficient than baseboard or forced-air systems, which saves money on monthly fuel bills. Since this method uses less electricity, it is ideal for homes off the power grid or in areas with high electricity prices. Another great aspect of radiant in-floor heating is that it can be used with a variety of energy sources, including propane and natural gas, oil-fired boilers, wood-fired boilers, solar heaters or a combination of these. A forced-air system heats the room from ceiling down, suffering big losses. Only the air is heated. 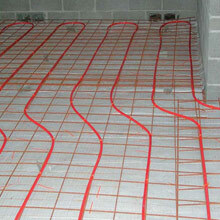 What are some common applications that radiant in-floor heating is useful for? 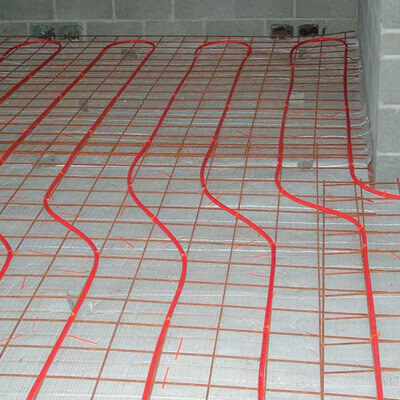 Radiant heating systems are ideal for both single and multi-zone applications in barns, garages, homes, greenhouses, warehouses and other buildings. 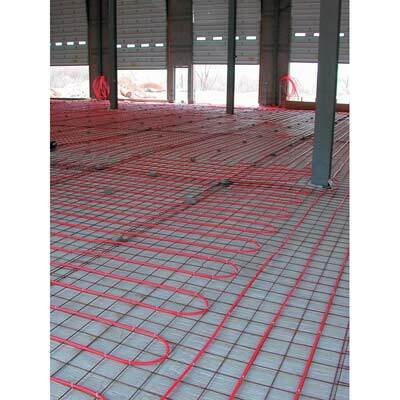 There is no building too small or too large for using a radiant heating system. The components you need will simply vary depending on the size of the system you will be using. 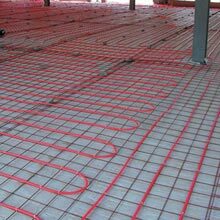 We have seen the most success with radiant in-floor heating in applications using concrete slabs, because heating costs are lower compared to forced-air systems. One of the most popular applications utilizing concrete slabs is greenhouses. Radiant heating in a greenhouse allows for even heat distribution with minimal cool spots which keeps heat at the root mass. This is beneficial because you can grow crops all year round and bring them to market earlier than the competition. Some customers have experimented with pex tubing in the soil in raised beds, while others have run the pex tubing right under their grow tables. Keep in mind that you need insulation under the concrete slabs in order to prevent heat transfer loss. We recommend TekFoil Reflective Insulation, and in northern climates, 2" foam board is recommended under the TekFoil. You should also check with your local codes representative because each state and county has different requirements for this. 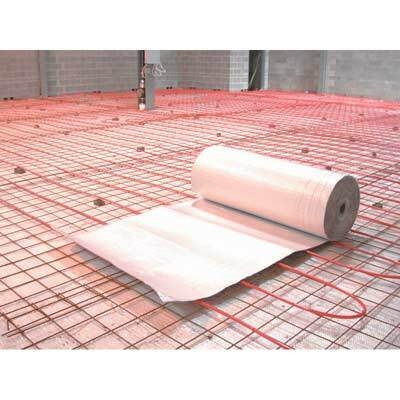 Another common application for radiant heating is under driveways, walkways and aprons. Utilizing a radiant heat system in these types of applications saves time and money by eliminating the need to shovel and salt the area during winter months. 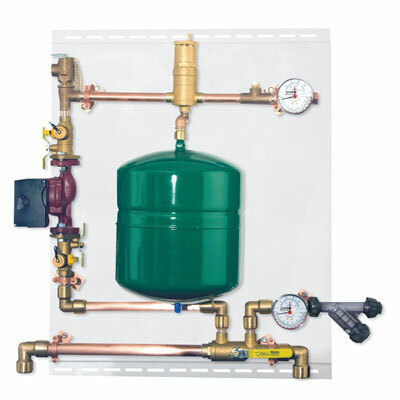 Our Snow Melt Kit (109688) allows you to easily and efficiently operate a hydronic heating system under these areas. The system works by monitoring the outdoor air temperature and presence of moisture every 25 minutes and then triggering a hot water flow from the boiler to the heating element under the area to keep it free of snow and ice. 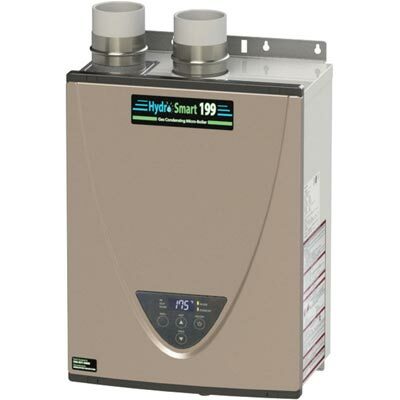 What are the typical components used in a hydronic heating system? Certain factors need to be considered when planning your radiant system. Among these factors are the heat load calculation, choice of heat source, primary and secondary plumbing, and the number of zones or subzones that will need to be heated. 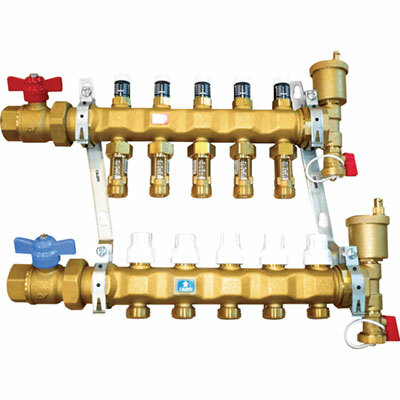 TekSupply offers everything you need to build your entire radiant system, including heat sources, thermostats, primary and secondary plumbing panels, manifold assemblies and Pex B and Pex-Al-Pex tubing and fittings in a variety of sizes. For help in selecting your system components call your National Account Manager and ask to speak with one of our radiant specialists. Have questions about Radiant Heating? Visit our Live Help page or Contact Us.